Primary degenerative scoliosis begins to occur with the deterioration of spinal discs and/or facet joint degeneration. Type 2: Idiopathic adolescent scoliosis of the thoracic/lumbar spine which has progressed into adulthood. (a) Scoliosis following idiopathic or other forms of scoliosis, or has occurred due to a leg length discrepancy that has created pelvic obliquity, hip pathology, it lumbosacral transitional anomaly. The spine's normal curves occur at the cervical, thoracic, and lumbar regions. The cervical and lumbar regions exhibit a slight lordosis curve, while the thoracic spine has a slight kyphotic curve. These curves position the head over the pelvis and work as shock absorbers to distribute mechanical stress during movement.3 However, a scoliotic spine will have a lateral deviation either to the right or left, and in some cases, both. The most frequent clinical problem of adult scoliosis is back pain.1 This back pain can be caused from either the curve of the spine or at the apex of the curve, or from localized facet joint compression.1,3 Furthermore, pain can also occur from paravertebral back muscles in spasm, standing or sitting postures, and certain physical activities. Finally, curve progression may also be a symptom in adult scoliosis. For those with de novo scoliosis, the curve in a spine may continue to increase with continued degeneration. The physician will measure the curve with each visit to track any progression of the curve. Adult scoliosis can develop in one of two ways. The first possible cause is that the disease developed during childhood or adolescence, but went untreated. Thus, the curvature has continued to progress. A physical examination of the patient begins with assessing standing posture. The trunk, pelvis, and shoulder girdle are viewed in the posterior, lateral, and anterior views to see if there is any rotation. Asymmetry in any of these regions should be documented and measured to compare against the contralateral side. Another technique a physical therapist can use in conjunction with the Adam’s Forward Bend Test is assessing the shape of the spine using a plumb line. The plumb line is held posteriorly at the C7 vertebrae and is dropped so that it hangs just over the gluteal muscles. If there is a deviation of the spine either to the left or right of the plumb line, then scoliosis may be suspect. Finally, simple palpation can be used to feel for any variance in shape of the spine, or if muscles in the thoracic or lumbar regions feel more prominent one side than the other. Provocative testing can also be used to determine whether the pain is due to the spinal deformity, or whether it is from a nerve compression or disc problem. In trying to differentiate the cause of back pain, a discogram can be administered. During a discogram, dye is injected into the center of a spinal disc. Then, an X-ray or CT scan is performed to see whether there is damage or degeneration present.2 Tests like these are important because they help to determine which treatments to proceed with for the patient. Treatment for the majority of individuals with adult scoliosis is non-operative. Exercise and conditioning is often the mainstay of non-operative treatment and helps the patient maintain function and energy level, as well as control back pain. A low-impact aerobic exercise program may include walking, swimming, yoga, or cycling, along with resistance training. Exercise may help improve cardiopulmonary reserve, promote endorphin production, control weight, and possibly delay or retard onset of age related osteoporosis. Bracing is rarely used in the adult patient because the spine has already reached skeletal maturity. However, it may still provide pain relief to those who are not good candidates for surgery. Bracing tends to be avoided in the middle age patient so that the muscles of the back do not become too dependent on the support provided by a brace and begin to decondition. For patients with degenerative scoliosis secondary to osteoporosis or osteomalacia, management includes calcium and vitamin D supplements, as well as exercise and resistance training to decrease and prevent further degeneration. Finally, for patients who present with severe back pain and radicular symptoms, nerve root blocks or epidural steroid injections are administered to help alleviate pain. Injections can be used to prolong the need for surgical interventions. Depending on whether the scoliosis is a result of vertebral degeneration or progression from adolescence, there are a variety of surgical techniques that may be performed. Posterior fixation is one of the most common procedures used to improve adult scoliosis.11 Two rods are fixated on either side of the spine with wires and pedicle screws to prevent further rotation of the spinal segments. The procedure can also be performed using an anterior approach, which is at the discretion of the surgeon. For patients with degenerative scoliosis, spinal fusions are sometimes performed to prevent further breakdown and deformity of the bone. Typically, spinal fusions will occur in the lumbar vertebrae and extend down to the sacrum where the majority of force is being displaced.11 Pelvic fixation may also be required to provide optimal stability. For patients with a rib hump caused from a thoracic curve, a thoracoplasty may also be a surgical option. Thoracoplasty is the removal of approximately four to six segments of adjacent ribs that protrude. The removal of ribs is based on either their prominence or by which ones are unlikely to be realigned by correction of the curvature alone.11 Thoracoplasty can be performed as part of a spinal fusion or as a separate surgery. Contraindications to surgery apply to elderly patients who are not healthy enough to undergo such surgery or with severe osteoporosis that makes them poor candidates for surgical intervention. The symptoms and physiology in the adult patient with spinal scoliosis is more complex when compared to a child or adolescent with scoliosis12. Even with the use of a brace, the progression of the disease cannot be halted. Therefore, the goal of using modalities on adult patients with scoliosis is to treat the secondary symptoms. These include back pain, muscle imbalances, and posture. One of the most basic treatments to alleviating pain and discomfort is cryotherapy. Cryotherapy can decrease pain by decreasing pain fiber transmission and nerve conduction velocity13. Application of ice packs or ice massage are two common techniques that can be applied to sore, painful back muscles caused from the spinal deformity. Unless the patient is unable to lie on his stomach, he should lie prone while the cold therapy is being administered. Extra layers of towels or clothes should be used based on patient tolerance to avoid the risk of ice burns or peripheral nerve injuries. In an acute flare up of back pain due to scoliosis, thermotherapy can also be an option. By applying moist heat packs to the painful area of the back, nerve conduction velocity increases, and the conduction latency of sensory and motor nerves decreases13. Thus, there is a perceived reduction in pain perception. Unless the patient is unable to lie prone, he should lie on his stomach with the warm packs placed over the painful area. It is important to keep in mind that additional towels may be needed if the patient is lying supine on the heat pack to reduce the risk of a burn. The application of heat should not exceed 108 degrees, or go longer than 20 minutes13. Gentle stretching should follow heat therapy to improve the collagen extensibility of the aggravated muscles. In addition, ultrasound can also be used as a modality in controlling the pain in back muscles. One MHz frequency ultrasound is considered appropriate for heating tissue up to 5 cm deep13. Duration and frequency of ultrasound in the adult scoliosis patient is going to vary, since there are a variety of causes responsible for the spinal deformity. Depending on whether the scoliosis is a result of collapsed vertebrae or idiopathic beginning during adolescence, several studies indicate that ten minutes of ultrasound 2-3 times per week for 3-4 weeks resulted in a reduction of pain6. Muscles imbalances and weakness are also another secondary symptom associated with scoliosis. According to the overload principle, the greater the load placed on the muscle and the higher the contraction produced, the more strength the muscle will gain13. This is an important concept in scoliosis, as the weakened muscles can lead to a lateral or kyphotic posture. To help retrain and strengthen the back musculature, neuromuscular electrical stimulation (NMES) can be utilized. The electrical current produced from stimulation recruits muscle fibers to fire, causing increased load on the muscles ipsilateral to the spinal curve, and thus an increased balance in musculature12. However, as stated previously, NMES will not halt the progression of the curving spine; it will only help to strengthen the muscles around it. Although little evidence exists that supports the use of traction in treating adult scoliosis, there are a few products that exist that may promote the relief of pain associated with scoliosis. For example, the Scoliosis Traction Chair is designed to “incorporate de-rotation, de-compression, and lateral traction while simultaneously providing stabilization of the posterior thoracic rib arch”14 Furthermore, it isolates the trunk rotator muscles ipsilaterally, providing isometric conditioning to strengthen the weakened core musculature. 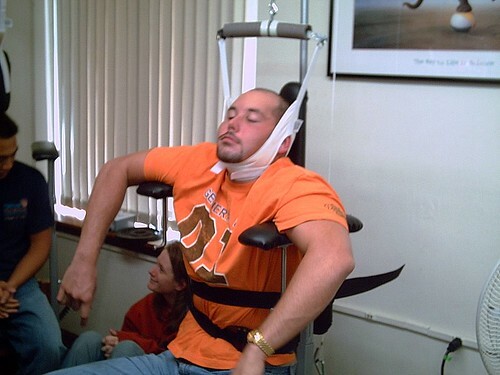 The Scoliosis Traction Chair also incorporates Whole Body Vibration (citation) as a means of retraining the neuro-muscular proprioceptive pathways. According to Kerschan et al, this vibration increases bone density, relieves pain & inflammation, and increase flexibility by stimulating the various tissues and systems of the body14. Therapeutic modalities following surgical intervention can include cryotherapy and thermotherapy. However, because surgery typical includes the insertion of metal rods and plates to hold the spine in place, modalities utilizing electrical current or traction are contraindicated. 2. Silva FE, Lenke LG. Adult degenerative scoliosis: evaluation and management. Neurosurg Focus. 2010;28(3):E1. 3. Dawson EG. Scoliosis in Adults. SpineUniverse. http://www.spineuniverse.com/conditions/scoliosis/scoliosis-adults. Updated May 2010. Accessed November 2010. 6. Birkes JK, White AP, Albert TJ. Adult Degenerative Scoliosis: a review. Neurosurgery. 2008;63:A94-A103. association with the choice of operative versus nonoperative management. J Neurosurg Spine. 2008;9:326-331. 8. Koumbourlis AC. Scoliosis and the respiratory system. Pediatr Resp Rev. 2006;7:152-160. 9. Simpson R, Gemmell H. Accuracy of spinal orthopaedic tests: a systematic review. Chiropractic & Osteopathy. 10. Cassar-Pullicino VN, Eisenstein SM. Imaging in scoliosis: What, why, and how? Clinical Radiology. 2002;57:543-562.10.1053/crad.2001.0909. 11. Heary RF, Kumar S, Bono CM. Decision making in adult deformity. Neurosurgery. 2008;63:A69-A77. modality for older patients with adult scoliosis, while deformity guides treatment for younger patients. Spine. 14. Kerschan-Schindl K, Grampp S, Henk C, Resch H, Preisinger E, Fialka-Moser V, Imhof H. Whole-body vibration exercise leads to alterations in muscle blood volume. Clin Physiol. 2001;21:377-82.